NOTE: Updated at 2:31pm Eastern to reflect new or updated information. A few conservative blogs are circulating some unsubstantiated rumors that Freddie Gray Jr. had spinal surgery a week prior to his fateful arrest and subsequent death in Baltimore Police custody. The claim appeared almost simultaneously in three places: The Facebook page of Baltimore-based Fox affilate WBFF, the blog The Conservative Treehouse, and the blog The Fourth Estate. 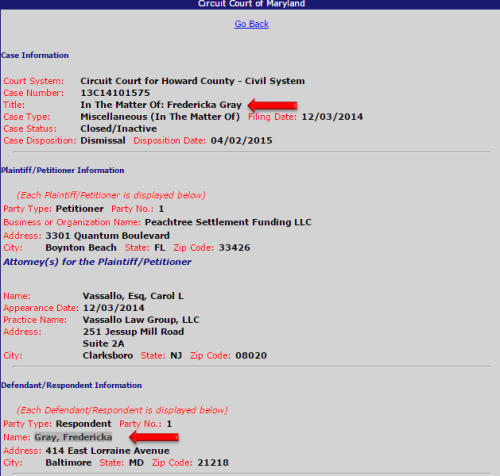 Public records from Maryland County courts were linked, but much of the claim hinged on “sources” and dot-connecting. At the time of my search, I found this case for Fredericka Gray (Gray’s mother). In any case, this case involve Gray as party to an out-of-court civil settlement with Allstate, and not from a “recent car accident”. The Baltimore Sun has since reported that these cases involve the restructuring of that settlement. Of course it is still possible that Gray was involved in an automobile accident and/or had spinal surgery a week prior to his arrest, but the dots certainly do not connect in the manner that the conservative blogs would have you believe. And even if Gray had a recent surgery, that still does not absolve the Baltimore Police Department of what appears to be obvious neglect of a suspect in their custody. Snopes has gone back and forth on this all day, sometimes it is listed as “False” and sometimes as “Undetermined”. Until evidence supporting the “Car accident and surgery” narrative surfaces, though, I’m inclined to believe it’s false. You are mixing up your cases. There is a case for lead but there is also a case from a car accident, or do you think they sued a taxi company for lead poisoning? The named defendants in the lead paint case are Dear Management And Construction Co., Inc. and BGM Realty #4 Corporation among others. This case was settled and paid in 2008. If there are other cases, as you suggest, please provide case # and I’ll update if needed. There are 25 cases since January 2008 involving Taxi Management Inc, none of those appear to list Gray nor Terrance Gainey n any capacity whatsoever. 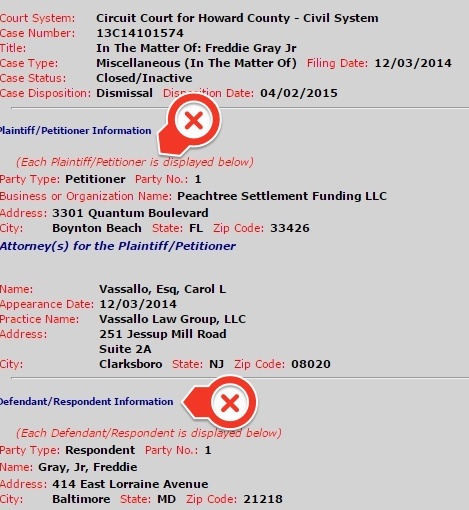 I’ve revised my original article based on re-examination of the records pertaining to Freddie Gray. so, thanks for that! Initially i didn’t see 13C14101574 (and was unable to find it when the site started 404’ing on me), only 13C14101575. Both of those are related to the lead paint issue.